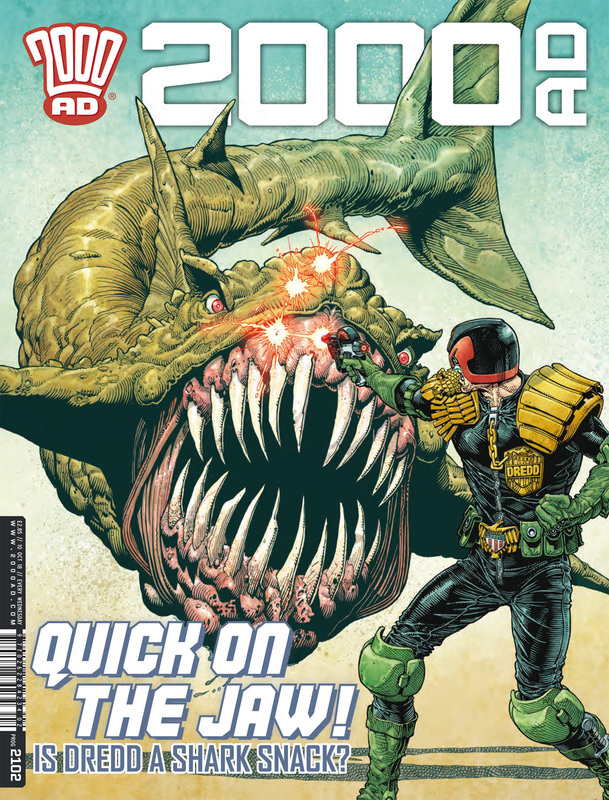 Here are some thoughts on Prog 2102 of 2000 AD – out now digitally and in print – continuing the ongoing stories! Kurtis is getting to know the inside of the smallspace, and we get a better idea of her mission. There is obviously something very shady going on and things have taken a quick downturn for the company. It’s good that Kurtis has some support, but something tells me that she won’t have too much help in the future – i can see this going south! The faster timescale does speed up the storytelling though! I’m really enjoying this story – the story itself is gripping and there are some interesting bedfellows in this story – wites and vampyres for a start, then possibly witches! The art is excellent, with that haunting light you get with moonlight on snow! This was a quick episode of Skip Tracer – going into his brothers mind wasn’t going to be easy, but it seems Skip has no choice either way. There is an added complication as to the mission – Skip’s brother has a lover, and she wants him back (as does Skip I expect) the General only wants information, so I have a feeling at least one of them is going to be dissapointed! The move into the new reality is interesting, and already Skip is in trouble! Gene gets some information about the ticks – and it seems that these aren’t the ticks he was worried about. We shall see about that. He gets and offer, but there is no answer. Meanwhile the humans have landed and are looking to get their codes back. This is interesting, and the reaction of those in space adds more to the clock….